As a home builder seeking to make his residential developments energy efficient but also affordable, Odessa Group co-founder Nathan Stone was excited when he was invited to become one of the builder participants in the Local Energy Efficiency Partnership (LEEP) program in April 2015. That’s because LEEP helps builders identify the best energy efficiency solutions for their regions as well as provides access to resources for designing and constructing high performance homes. The program, which is administered through Natural Resources Canada and implemented through provincial partners such as BC Hydro, enabled Stone to upgrade one of the ENERGY STAR® certified homes he was already constructing in Harrison Highlands, Agassiz, to an ENERGY STAR “plus” standard. All of the homes in this subdivision are at least 20 per cent more energy efficient than homes built to the BC Building Code. The upgraded home achieved a 30 per cent better energy efficiency rating than a typical home. Click Here to read the full Vancouver Sun article. Odessa making a difference in one community by providing better-built homes for families. A typical new home in Metro Vancouver has air leakage rates of five to six times per hour. Nathan Stone, co-founder of Odessa Group, is building homes with half that — or 2.5 air changes per hour — thus meeting stringent energy efficiency standards, but at minimal extra cost to the homeowners. Instead of using ultra-high performance mechanical systems or materials, Stone is relying mainly on quality building techniques and support from BC Hydro to achieve his goals. As a result, Phase 1 of Harrison Highlands, a subdivision in Agassiz currently under construction by Odessa Group, is drawing attention for the homes’ ENERGY STAR® certification, as well as being an affordable investment for seniors, families, and those seeking a unique lifestyle experience. Odessa Group is honoured to be named as a finalist for the 2017 National Awards for Housing Excellence. “These awards are about excellence and recognizing the very best in Canadian new homes, home renovations, community development and marketing across Canada,” said CHBA Chief Executive Officer Kevin Lee. The winners were selected by a national panel of judges who met in Ottawa over the course of three days to review the finalists’ entries. “When you are judging the best in Canadian new homes, there is no doubt that as a judge you have your work cut out for you. With so many exciting and innovative projects to choose from it was a challenging task, and it took a practical army of judges from coast to coast to do it justice! The process also makes it a huge honour to win, so there will be great anticipation and excitement when the winners are announced in May,” said Lee. Click Here to view a complete listing by category of all the CHBA National Awards for Housing Excellence finalists. Odessa Group has been honoured with three CHBA Fraser Valley Housing Awards for homes recently constructed in our new Harrison Highlands community. Chilliwack builder and developer Nathan Stone has been re-named to the Canadian Home Builders' Association national board of Directors. Nathan first got involved as a CHBA board member with the Fraser Valley local association, and has served in various CHBA roles over the past 6 years, including CHBA BC President. Last year, he was first elected to the second vice-president role on the national board of directors, and this week he was re-affirmed by the membership at the CHBA conference to continue the position for the second year. "Our industry is diverse and we have many regional variations in how we build and the challenges that we face. It is important for us to have as broad of a representation as possible - this will allow us to continue to be the voice on behalf of industry stakeholders and our customers," said Stone. Click Here to read the full news story. At Odessa Group’s Harrison Highlands, buyers won’t have to compromise on what they’re looking for in a new home. Harrison Highlands recently celebrated its grand opening weekend and the response was tremendous. Click Here to read the full Chilliwack Progress article and learn more about the craftsman architecture and floor plans for the new Harrison Highlands homes. Odessa has been a proud member of the Canadian Home Builders Association of the Fraser Valley since their establishment in 2007. 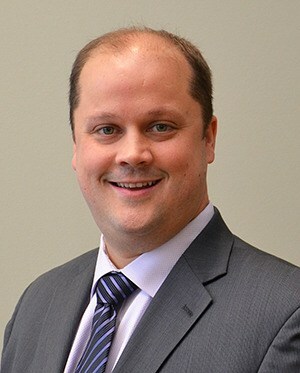 Managing Partner, Nathan Stone, served as President of the CHBA FV for the past two-years where he took an active role in supporting several key initiatives and furthering the CHBA FV’s success. His leadership helped bring vision and purpose to the direction of the association through the ongoing strategic planning process; he worked with and encouraged other members in their respective businesses and participation in CHBA FV. With his cheerful and positive outlook, Nathan was a great asset in his interactions with all levels of government and the association as the voice of residential construction. Nathan’s commitment to the industry was even more evident when he took on the role as Chair of the Education & Training Committee at the provincial level, and representing the association in Ottawa. This fall, Nathan is continuing his support by moving on to become the President of the Canadian Home Builders Association of BC, and is enthusiastic about representing the voice of the industry on a broader scale. 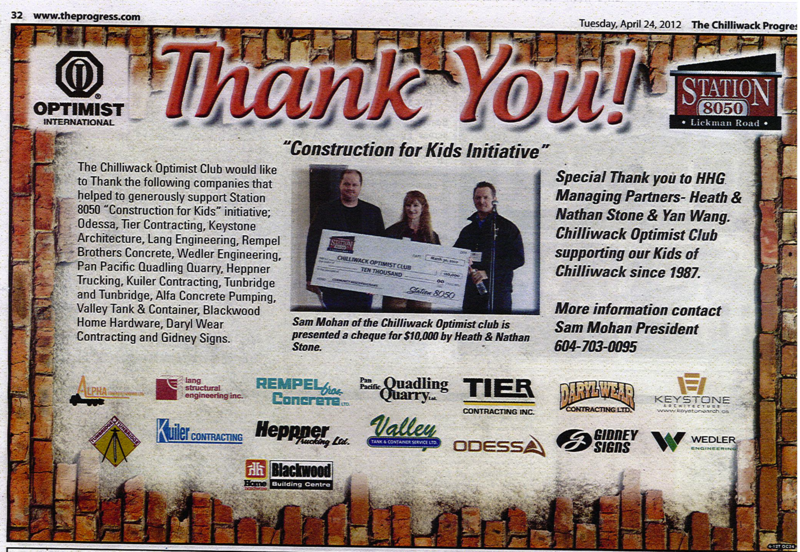 Odessa along with 14 other construction contractors and trades, presented the Chilliwack Optimist Club with a $10,000 cheque at the Station 8050 Construction Commencement Ceremony on March 30, 2012. Club President, Sam Mohan, expressed sincere appreciation on behalf of the organization and youth that will benefit from this generous donation. Step into your new home at Falcon Ridge and breathe in the open space, tall vaulted ceilings and fresh mountain air coming in from dozens of oversized windows. These houses are all finished with top quality hardware; from hardwood floors to granite countertops and crown accents throughout the house. The level entrance ranchers start at 3,000 square feet in size, split across three levels. A desirable single floor living concept is perfect for empty nesters and families alike - with all amenities on the main floor including kitchen, laundry and master bedroom - with plenty of space downstairs for a recreation room, up to 3 bedrooms and a sundeck. Odessa and Gidney Signs put up an impressive project sign to official mark the Station 8050 construction site. Station 8050 is a 7.5 acre property beautifully designed to accommodate up to 35,000 square feet of retail commercial facilities, anchored by a welcoming 75-room Hampton Inn by Hilton. The site is located adjacent to a stream and environmentally protected area making it in an ideally secluded zone but still with easy access to the freeway. The Hampton Inn will be the first hotel built in Chilliwack in over 20 years making it the newest hotel in the market. It is being built with leisure, corporate and government markets in mind, designed with meeting rooms, fitness center, indoor pool, water slide and jacuzzi. The commercial component will offer six unique buildings designed to accommodate between 12-16 tenants, three of which will have drive-thru potential. The property has been ideally zoned for free standing coffee, full service restaurants, convenience stores, retail service units, and recreational retail uses, making it a great asset to Chilliwack's expanding west side. Nestled on the southern slope of the Sumas Mountains in Abbotsford, Falcon Ridge is a community of boutique homes featuring breathtaking views of Mount Baker and the Fraser Valley. Romspen FC Homes commitment to the property and confidence in this exceptional mountainside development is shown in their proceeding with the construction of 4 model homes. They have hired 2 well known local builders Odessa Ventures and Windridge Properties to build the houses. Come visit and see yourself living in Abbotsford's newest luxury neighborhood. Combining classic style with modern convenience, our homes are perfect for families and empty nesters who want to live in nature while enjoying the advantages of having a ranch style home next to a major metropolitan area. Imagine waking up to the sight of farms spread across the valley floor like a tapestry with impressive Mount Baker standing at the horizon, all within 72 km from Vancouver and 15 minutes from Downtown Abbotsford. Enjoy what life in the Fraser Valley has to offer. Affordable luxury without compromise; you can let your imagination fly free! It won't be long before the fledgling development of Falcon Ridge spreads its wings and begins soaring to new heights! Odessa has been contracted to build elegant yet affordable family homes on the south slopes of Sumas Mountain. Construction on the first two model homes is scheduled to begin this fall. Imagine...enjoying an incredible view from every floor...and calling it 'Home'. To ensure you are fully informed of your project at every step, Odessa uses web-based software to show schedules, change orders, upcoming activities, and even pictures of your building project as it takes form. Easy to use, you simply log-in securely on a computer – anywhere and at anytime – to check in on your project.